Whether you’re promoting a small business or a nonprofit, you CAN be a marketing-savvy rockstar. …you think “marketing” doesn’t come naturally to you. …you’re not clear about what you do or who you’re for. …you’ve tried it before and the experience was less than stellar. …you don’t sell anything (but you still want to build a community or secure funding). The key is to figure out your brand positioning and messaging—FIRST! When you know your unique value and have the words to explain it, doing that marketing thing will be easier, more cost-effective, and way, WAY more successful. You’ll have everything you need to create and deliver a consistent message across all channels. You’ll quit wasting resources building websites and other marketing materials that don’t jive with you or your potential customers. You’ll have alignment between what you say and how others perceive you. Your clarity will attract the right customers and collaborators. And your confidence will significantly boost your income and impact. Marketing will feel natural and fun which means you’ll actually DO it! And when you do it, it will be so much more productive in all the ways that count. Find your brand's Star Power and chart your content course. Get the words to shine in any communication channel. 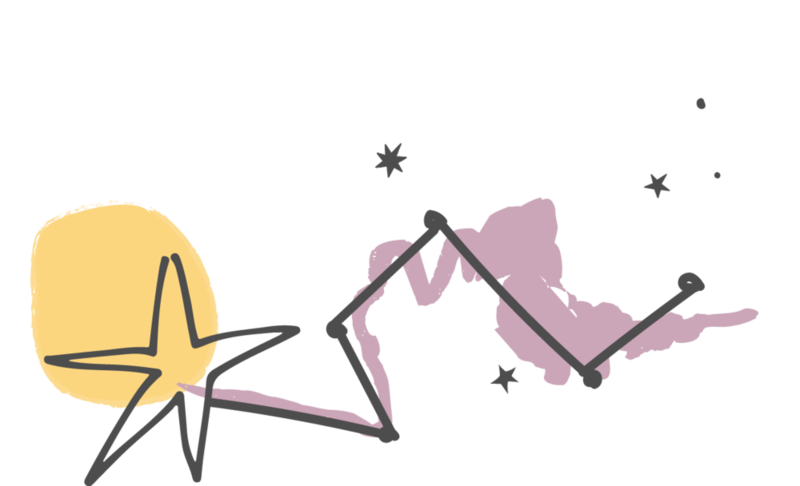 Draw prospects into orbit with a customer-loving website. A) Smile with confidence as the answer rolls off your tongue. B) Enthusiastically launch into a sprawling monologue of your business history, service offerings, and process. C) Seize up in horror because (dang it, you hate this question!) your answer always has you sounding like a scatter-brained sixth-grader. If you answered B or C, let's fix that! 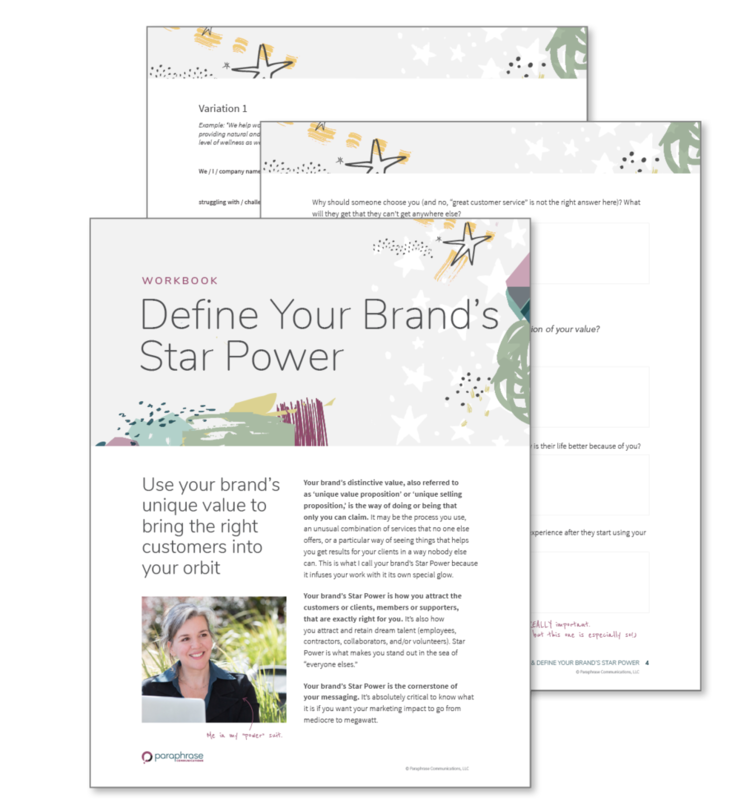 Get your hands on my free workbook: Define Your Brand’s Star Power. You'll discover your unique value and create a winning response that will have someone say, "Oh? Tell me more!" I’m Lisa—your guide inside the crazy constellation of marketing tactics and tech. I help entrepreneurs and nonprofit leaders translate their work into words and images that raise their visibility, broaden their reach, and grow their revenues. As a designer and copywriter with 20 years of experience, I walk both sides of the messaging world. This means I’m able to offer a unity and consistency to developing your brand messaging and identity that you can’t get anywhere else. You could work with a separate copywriter, a different designer, and yet a different web developer—lots of people do. Or you can work with me and get it all under one roof. I make it really Easy. Enjoyable. Effective. Just like your marketing will be.